We will be off in a week or so for a family holiday. After our holiday in the Land of The Rising Sun last year, we decided to go local this year and to coincide our holidays with a convention that we are attending. As I do my packing for the clothes and other stuff for the trip, I pack also for what I am going to read on the trip. I have not decided yet and most probably will wait till the last minute to decide. 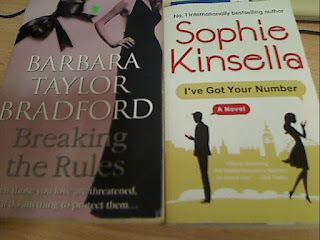 For now, it's a choice between I've Got Your Number by Sophie Kinsella or Breaking the Rules by Barbara Taylor Bradford. Whichever title I decide on, it would be something that I have to stick with for about two weeks as I only want to bring along one title. Breaking the Rules might last me two weeks but what if I am tired of it after a while as I didn't have good experience with what Barbara has to offer from the last few books that I read. Happy holiday and enjoy your reading. I've got your number is my most favourite stand alone book from Sophie Kinsella.